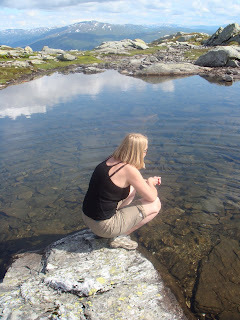 We decide to stay in Voss overnight so we'd be able to have another day in 'the nature'. Our shoes dried on the hotel room window ledge while we struggled out of bed. We hoped we wouldn't be too sore from our so-called 'baptism of fire' yesterday and sure enough we felt pretty good as we stuffed ourselves at the buffet breakfast in the hotel on cereal, warm fresh bread with cheese and cold meats and mugs of fresh filter coffee. I'd been eyeing up what I thought was a small peak above Voss, a few kilometres from the plateau we were on yesterday. The mountain's bleak rocky top loomed up from the surrounding moorland and a huge tower sat on the summit. A quick trip to Tourist Information first to buy a 1:25,000 map of the area and we could see the peak we wanted to nail. Lonahorgi's summit was at 1410m according to the map and the car park was at 47m. Totally doable I thought to myself. How big is that anyway? Snowdon? Ben Nevis? I didn't have a clue to be honest. My hiking experience was limited mainly to the SWCP and the surrounding countryside. 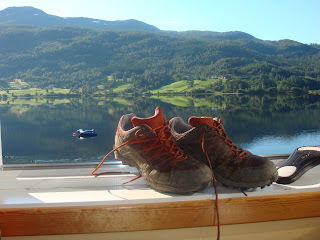 Having been hiking in Norway loads of times in the past M informed me that distances in Norway were always further than they seemed and that we shouldn't under estimate the challange we'd set ourselves. I knew it would be a tough day and that we weren't quite at optimal hiking fitness by any stretch of the imagination but come on, we'd seen kids running around the surrounding hillsides! We were probably slightly over packed, I was carrying both our gear in the Jiri 35, but we thought it was better to be safe than sorry for our first day up high. We set off at a good tempo following the red 'T's' that mark the DNT footpaths. The path took us through rocky outcrops, boggy valleys and twisted and turned up over the plateau and onto the lower slopes of Lonahorgi. The weather was stunning. Blazing sunshine and blue skies with just a sprinking of high clouds that brought welcome relief every now and then. The path kicked upwards again, the summit tower dissapearing intermittently as we crested several large 'steps'. We passed several locals out enjoying 'the nature'. Leather boots and short shorts are de rigeur in seems. Everyone shared a friendly 'hei' as we headed up through 800 then 900 and 1000 metres according to the map. After a few hours we needed to assess the situation. We were not going to make it back to the cable car in time for the last car down the mountain so now we had to factor in an hour and twenty minute descent at the end of the day, down the very steep path we walked yesterday. 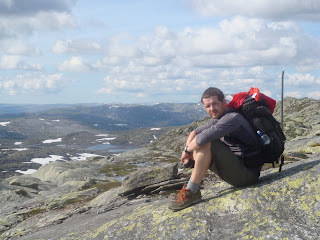 We pushed on, both in agreement that we could safely reach the summit and get back down to Voss in plenty of daylight. Then the mountain changed. Instead of following twisting paths through moorland and rocky outcrops the path became an indistinct line across solid granite slabs, punctured with small tarns and piles of scree. 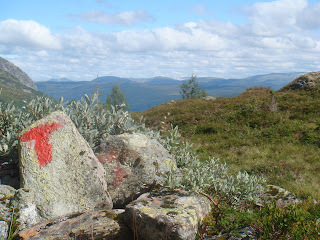 The red 'T's' daubed on rocks and small cairns were the only sign that we were still heading in the right direction. We came across pockets of snow here and there which made me wonder about the suitability of using lightweight trail running shoes but they coped fine, even when we had to cross a 40 metre wide snow belt. Brief glimspes of the summit tower kept us motivated but slowly we realised that the summit may be just out of our reach today. We hadn't started until midday and had plenty of daylight up here at this lattitude but we had been walking up for nearly four hours now and every step towards the summit was another step we'd have to take down again. Another alarm bell was the fact that we'd stopped seeing locals heading down. We were the last people on the mountain, in fact the last local we saw at around 1200m seemed suprised that we were still heading up. Finally, at 1370m we decided to call it a day. The four storey summit tower sat there, another 40m higher and less than a kilometer away but the terrain was basically scrambling on hands and feet over shark fins of granite, possibly another 45 mins one way and potentially another hour and a half to add to the four hours back to Voss. We sat there, ate our tea of bread rolls, lamb sausage, banana and handfuls of gorp and stared at the stunning views of the Western Mountains. I was dissapointed not to make it to the summit this time but grateful for the views, the lessons learned and the fantastic adventure we'd been on. After a few photos we pointed ourselves downhill, tightened the rucksack straps and headed back down the mountain. It took four hours to get back to the car. All the way down we fantasised about the cable car still running, about paragliders offering us a lift off the mountain, about ice cold Gatorade at the garage and what we could eat for supper. The last hour and a half of sliding down the steep path into Voss was torture on the feet and soul but we made it, with about 45 minutes of daylight, half a bottle of water and half a packet of peanuts left. Suddenly yesterdays so-called 'baptism of fire' felt like a walk in the park. What a great adventure, Joe......even though you didn't quite make it. At least you've still got a peak to make next time. Here we were thinking 'poor you having to get used to a new country' but now there's some unashamed jealousy creeping in too! You tell a good story Joe - keep 'em coming (once your legs have recovered).